Formed 1994 in Montreal, Quebec, Canada. Originally called Godspeed You Black Emperor!, before later using Godspeed You! Black Emperor. As an experimental nine-piece from Montreal, they specialise in instrumental music. Members consist of Roger Tellier-Craig (guitar), Norsola Johnson (cello), Efrim Menuck (guitar), Mauro Pezzente (bass), David Bryant (guitar), Thierry Amar (bass), Sophie Trudeau (violin), Aidan Girt (percussion), and Bruce Cawdron (percussion). 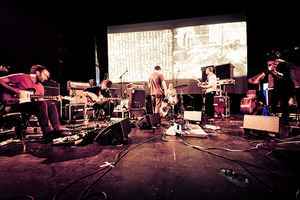 Viewing All | Godspeed You Black Emperor! G.Y.B.E., God Speed You Black Emperor!, God's Pee, Godspeed, Godspeed You Black Emperor, Godspeed You! Black Emperor, Godspeedyoublackemperor, GYBE, Thee Godspeed You Black Emperor!, Theegodspeedyoublackemperor! Saw them live this year. Awe inspiring, full of hope and bleakly beautiful. I can't believe I have their entire major discography in vinyl. Bless Constellation for keeping their catalog always available. Does anyone know if I can find the song East Hasting on a vinyle support ? I always thought it was "Godspeed You! Black Emperor" in lieu of "Godspeed You Black Emperor!". Anyone care to clarify this? So supreme to make me truly feel hopeful about our humanity. This is music of unrivalled depth for me.Exploring themes which are becoming ever more relevant in these troubled times,Godspeed manage to harness despair,frustration and sadness but also reflect hope and inner strength at the same time.It's music which takes the listener beyond that which he or she is hearing.The music itself is generally laced with spoken word / interview samples,which inspite of not being a new idea,brings a great deal to the atmosphere created and leads the listener in different directions throughout.This is not to say that these samples pre-determine the listeners journey in a negative way,but rather keeps them tuned in to the message and thoughts trying to be conveyed by the band - those of change,decay,injustice and so on.Whether we choose to derive positive feelings from the music is more a product of our (the listeners) disposition. Either way,this music will move you.